For some, Detour is the greatest B-movie ever made, from the era when a second feature was simply taken for granted, even tolerated as something to get through until the main attraction began, to be lumped in with the advertising, the cartoons, the short films, all that ephemera that clogged up a trip to the local fleapit to see the real stars parade across the silver screen in the A-movie. 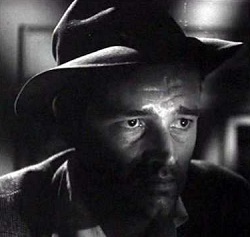 Detour has some competition among the classic B-movies, especially from the nineteen-forties, as some would place Val Lewton's Cat People above it, for instance, yet for sheer film noir atmosphere, there was little to beat it. 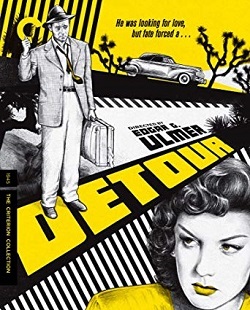 Detour was directed by one of the finest of cult auteurs, certainly in the realm of supporting features: Edgar G. Ulmer. A refugee from the turmoil in Europe, he like so many others applied his particular outlook born of having to escape an evil power abroad to his fictions; rarely getting a chance to helm an A-picture, his biggest success was the Boris Karloff-Bela Lugosi horror The Black Cat which has a similarly doomladen take on the world that, by the time he was making this effort in 1945, the planet was meant to be emerging from into the blessed relief of the sunshine of peace. So why didn't film noir reflect that? Probably because there are things you cannot unsee, and horrors you cannot unhear, and the Second World War had subjected millions of ordinary people to the endurance the conflict bred. The ex-soldiers returning to the United States settled down to what they hoped would be a war-free world, but there were refugees also, and a sense that even if we had managed to retain some innocence after World War One, there was no way any of that was coming back now we knew of the Holocaust or the fascist ideology that had justified the slaughter of so many to itself: the climate was topsy-turvy, and into this arrived film noir. If you could not understand why these horrendous acts had occurred, you might have some sympathy with the protagonist of Detour. When we meet him, he is convinced bad luck has dogged his heels and is punishing him for some original sin he can barely grasp, yet it is more like his downbeat outlook on life has attracted the ill fortune, as if to fulfil his view of the world as somewhere he cannot catch a break. "Think everyone and everything is against you?!" crows this fate, "Well, you don't know the half of it - now you'll experience real suffering!" In the middle of it was our hero, or was he an anti-hero? Tom Neal was the actor who essayed this role, his otherwise undistinguished career in movies (some admire his work in serials away from Detour, but that's about it) seeing this was the assured highlight. Adding to the intrigue was that Neal's biography could have been a film noir in itself: the boyfriend, on and off, of fellow lower-level star Barbara Payton, he assaulted actor Franchot Tone for his interest in her, despite Payton marrying Tone - and she would keep going back to Neal until they finally broke it off. Later, Neal married someone else: who he shot dead, getting a few years in prison for manslaughter and dying after his release. This bad boy glamour should really be apparent in Neal's performance in Detour, yet all the way through, with his crumpled expression looking as if he's almost continually about to break down in tears of self-pity, he does appear to be opening the door to Hell and inviting it in for a drink. Coffee is what he drowns his sorrows in, in a selection of roadside diners he hitchhikes between, a lost soul, bursting into occasional anger when someone puts the wrong song on the jukebox, the song that reminds him of the love he lost, or to be more precise, the love he was forced to give up due to circumstances beyond his control. He was supposed to head out to Los Angeles, following his singer fiancée - he was her pianist - but on the way he is picked up by an apparent travelling salesman who in a freak accident ends up dead in a ditch. It should be funny, this amount of grimness following Neal around, but his utter desolation doesn't encourage much laughter, though you might be amused here and there enough to chuckle hollowly. He takes the car solo, and on the way he picks up a woman hitchhiker who proves to be akin to a harpy from Greek myth, an avenging force that deigns to savage Neal for behaving as if society was pitched against him. 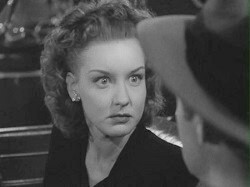 Well, now it is, and the appropriately named Ann Savage played this woman, her hostility apparent from minute one of her appearance. It's in her face, her fiery glare, her voice just a shade away from The Wicked Witch of the West from The Wizard of Oz. Savage didn't have too distinguished a career either, though at least she didn't wind up killing anybody, yet for cult movie buffs she will always be beloved, in an alarming manner, for her role in Detour. She knows that Neal isn't driving his own car, and believes the worst of him despite us being aware she's got him wrong, but his behaviour screams suspicion, and that's what she awards him with. The more she talks, the more Neal sinks into a quicksand of bad decisions and that bad luck that his circumstances are steeped in. He has to spend every waking hour in her company as she schemes to make financial profit of having him over a barrel - sell the car, pose as the dead man to trick their way into an inheritance. We know that he has seen her off because the film unfolds in flashback, but the way it happens is such a fluke that we can almost see the Devil peeking in through the motel room window and laughing heartily. That was the power of Detour, and Ulmer's vision; given he was convinced his work would not only be forgotten, but not even survive, it was encouraging to know all these decades later, Detour in particular continued to pick up fans who were captivated by its eccentric, rich and bleak magic.